Rice is the staple food for people living in Terai. Among several finger licking recipes made from rice flour, bagiya, the rice flour dumpling made by Tharus, is unique in shape and size. As it is steamed and cooked well, it is delicious and good for health. Once your taste buds are used to it, you will keep on asking for more. At least that is the case with me. ﻿﻿While it is tasty to eat, preparing it is a tedious task. The rice is soaked in water and ground in dheki, the traditional rice milling machine. These days rice mills have replaced the dhekis. However, the taste of the flour ground in a dheki is many times better than the one ground in a rice mill. ﻿﻿The flour is then sifted and fried. Warm water is mixed to it and it is kneaded enough to prepare the tender dough. Steamed lentils, spices, ginger and salt is added to the dumplings made from the dough. They are then flattened with the palms at the middle while both the ends are left protruding out. The dumplings are then steamed over a clay pot of boiling water. The steamed bagiya is served with chutney or vegetable curry. In Eastern Nepal, the Tharus celebrate the Govardhan Pooja (the day following Deepawali – the festival of lights) by worshipping their agriculture tools and cattle, and eating bagiya. 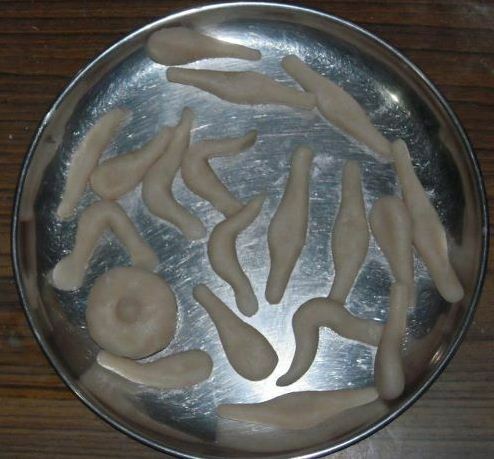 Every household ensure to prepare bagiya from the rice flour of newly harvested rice on that day. 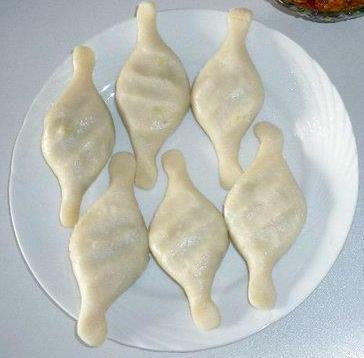 While Tharus in the Eastern Nepal prefer flat bagiya with lentils, the Tharus in the Western Nepal prepare bagiya of tubular shape, without lentils in it. Like sidhara and ghonghi, bagiya holds a special place in the Tharu cuisine. Similarly, Rajbanshis in the Eastern Nepal prepare bhakka, a delicious dish similar to bagiya. It is round in shape and has no lentils and spices in it. I've been visiting your blog a couple of times to learn more about Tharu culture. I was exposed to Tharu culture in my childhood, as my parents owned a piece of ricefield in Chitwan many years ago. I had tasted dhikries and bagiyas then, but I don't know how to prepare them the traditional ways. I wonder if you would you like to share your recipe with me? Please contact Kari Mahato of Tharu online for this. He is from Chitwan and will be able to help you out. Please mail him at sanghati@tharuonline.com.